Art, Food, Wines, Olive Oil. at the Mangawhai market every Saturday. Fill your own bottle EVOlive oil is available NOW! A day of fun in the sun! Mangawhai is a haven for many talented artists and crafts persons. Mangawhai Heads and Village is a great place to live and visit! A boating and surfer's paradise with safe swimming, fishing, excellent restaurants and quality produce. Follow the well sign-posted road off state highway one to find Northland's southern-most resort and discover for yourself the reason for Mangawhai's burgeoning popularity. Mangawhai beach is a surfer’s paradise as well as a safe patrolled beach for the kids. The estuary provides further safe swimming or, if a secluded long white sand beach is more your style, then Te Arai is only a short drive away. Surf-casting or rock fishing is popular at Mangawhai and Te Arai and there are good launching facilities for trailer boats at the community funded boat-ramp and pontoon. Donations from users of the facility are always welcome to assist with the maintenance, look for the honesty box at the boat ramp and an annual fee gives you a trailer sticker to show you've paid up. For those without a boat, we recommend you give RnR Charters a call, with 20 years experience out of Mangawhai, Wayne Radford is your man. If you've left your fishing gear at home, there's plenty of selection for fishing tackle and bait at the local tackle shop and petrol stations or the charter boat can organise it for you. The waters off Mangawhai provide superb fishing and world class diving, from the Hen and Chicken Islands to the Mokohinau Islands and Gt Barrier Island. As a marine playground, this is a spot with few equals. There is plenty to do onshore as well. Mangawhai Golf Club is an all weather coastal course that is ranked among the best in the North Island. Unique walking tracks, including the spectacular Coastal Track makes Mangawhai a great place to explore. With easy access to Te Arai beach, Pakiri, Langs and Waipu, Mangawhai is a holiday destination for everyone to enjoy. 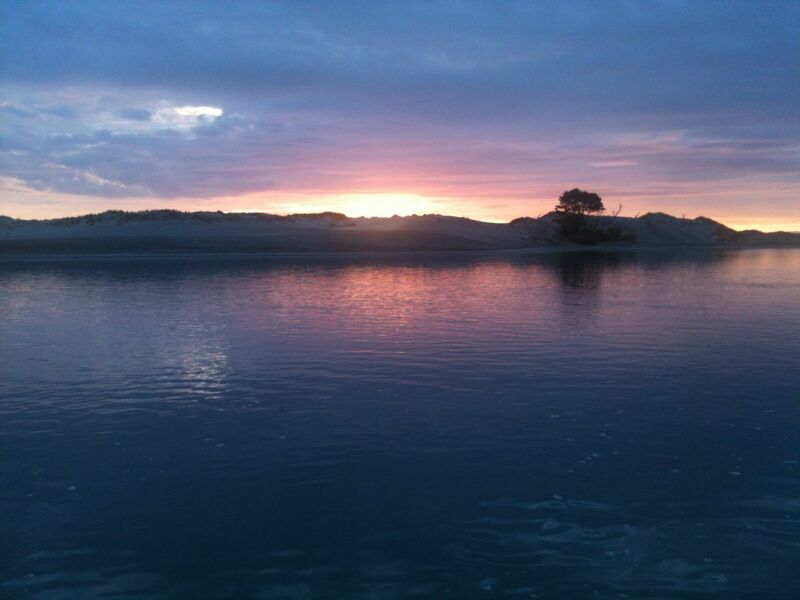 Come and find out why the locals know it as MAGICAL MANGAWHAI. Mangawhai's Harbour, the theme of the Mangawhai Museum, has always played an important part in our rich and varied history. Beginning with the Maori settlements, through to the early English settlers with their gum digging, shipping and kauri milling in the late 1800's and on to the present day as a popular seaside holiday destination. In summer Mangawhai buzzes with holiday home owners and tourists enjoying the many different activities and events on offer. With 5 beaches within a 15 minute drive, giving you the choice of sailing, fishing, surfing or just lazing on the golden expanses of sand. The Mangawhai Surf Lifesaving Club runs a popular summer programme of family-oriented beach activities. Local entertainment features top New Zealand bands at the historic harbour-side Tavern, and the Golf Club hosts many open tournaments while bowls and petangue are available at the adjacent Bowling Club, with mini golf at the Tackle shop at the Heads. The annual summer carnival is held every January 2nd and is hugely popular for its' full day of sideshows, stalls, displays and entertainment. Kayak across the harbour to the sand dunes or explore quiet mangrove-lined tributaries. Mangawhai's sand dunes are a dominant feature of the harbour. Administered by the Department of Conservation, they are home to the rare fairy and Caspian tern, variable oyster-catcher and the New Zealand dotterel. Fitness enthusiasts can participate in the Annual Triathlon, explore the many bush and ocean walks or register for the highlight of the year, the Mangawhai Walking Weekend which is held in either March or April each year. Experience the real magic of Mangawhai on the many guided coastal, farm and bush walks. Feast your eyes on the panoramic gulf views from the Whangarei Heads to Pakiri. Mangawhai boasts a thriving arts community, with over 40 artisans and craftspeople combining to open their studios for the annual Mangawhai Art Trail, held in conjunction with the Walking Weekend, but there are many opportunities to see the craft of these local atrists, at the Smashed Pippi, Sat mornings at Bennets, and Sail Rock Cafe just to name a few. Foodies are well catered for with licensed cafes/restaurants serving a diverse range of styles. With many locally produced foods and wines as well as award-winning Extra Virgin Olive Oil and Coffee, the Saturday morning farmers market is a great place to try tastings or visit our own local chocolatiere to try delicious, lovingly hand-crafted chocolates and fresh made Ice creams. You will find us on the Twin Coast Discovery Highway just 80 minutes drive from the Auckland CBD (turn off SH1 just north of Te Hana) or 50 minutes south of Whangarei (turn off SH1 at Waipu). Located midway between Auckland and the Bay of Islands and with many very comfortable and quiet choices for accommodation and dining, Mangawhai is a popular stopover for travellers of all kinds, wishing to rest up for a few days, either before leaving or upon arrival to New Zealand.